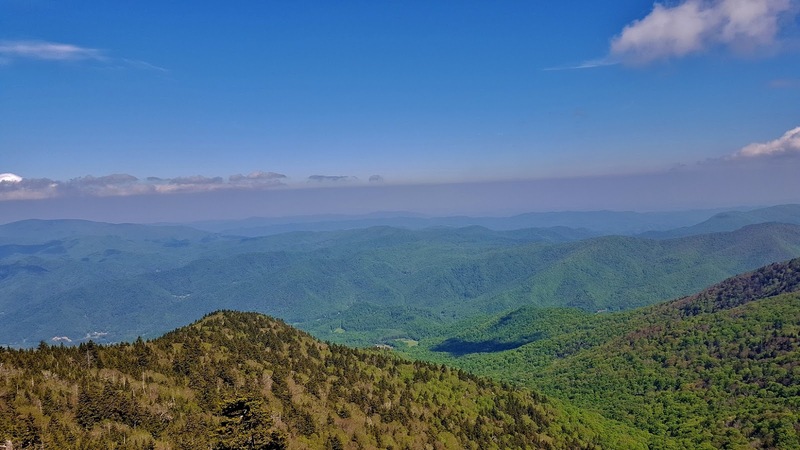 Memorial Day Weekend at Roan Mountain - Take a Hike! For Memorial Day Weekend, Sandy and I headed to Roan Mountain for a weekend of hiking and waterfalls. We left Friday after work and drove to Roan Mountain to our home for the weekend – Roan Mountain Bed & Breakfast. I had initially planned to camp at Roan Mountain State Park, but it was full for the holiday weekend, so we ended up here. It turned out to be a great stay and the innkeepers, Ann and Steve, were great hosts. Saturday morning, we had a delicious breakfast and then headed up the mountain. The parking at Carver’s Gap was already full at 8 in the morning, so we continued on towards the Rhododendron Gardens. After paying the day-use fee, we parked at the trailhead for Cloudland Trail (#1000). In a short ways along this trail, we cut across the parking lot and made a quick loop through the Rhododendron Gardens on Roan Mountain Garden Trail (#1002). This is the largest natural rhododendron garden in the world, but unfortunately, we were a little early for the blooms. It wouldn't be until mid-June before the rhododendron reach peak bloom. We got back on Cloudland Trail and hiked past the bus parking to the overlook at Roan High Bluff. At 6267 feet above sea level, this is the second highest peak on the Roan Mountain Massif. The actual summit is off-limits to protect sensitive wildlife, but near the summit is a wooden overlook. We had great views looking north into Tennessee from here. After enjoying the view, we headed back. Right before the parking lot, was another overlook with views looking north into Tennessee. Back at the car, we got on the Appalachian Trail heading northbound towards Carver’s Gap. About half way, we took the spur up to Roan High Knob Shelter, where some campers were breaking down their gear. It's a pretty nice shelter with a loft area, so quite a few campers could sleep here. We continued just a short ways past the shelter to the summit of Roan High Knob. This is the highest point of the mountain at 6285 feet. Although it’s the highest, the summit is forested so no views up here, just a big pile of rocks. We headed back down to the AT and then down to Carver’s Gap. There were many switchbacks heading down and we knew this would be a strenuous hike back up. At Carver’s Gap, we crossed the street and continued on the AT heading up Round Bald. This part of the AT is one of the most popular along the entire 2000-mile trail. 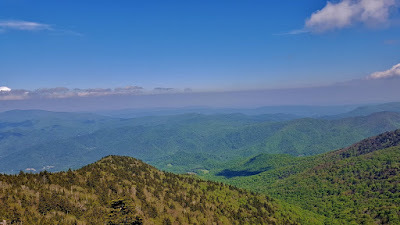 The balds on Roan Mountain provide spectacular, unobstructed views of the surrounding mountains and so lots of people come here to hike, especially on a holiday weekend. We stopped briefly at the summit of Round Bald to enjoy the views then continued on, heading down then back up, to Jane Bald. We then hiked to a split and turned right to follow a spur trail to the summit of Grassy Ridge Bald. This is the final peak on Roan Mountain above 6000 feet. We stopped here for lunch and to enjoy the wonderful views. In the distance we could see the Black Mountains towering on the horizon. It was crowded up here, so we didn’t stay long. After lunch, we hiked back to the AT and headed southbound across Jane Bald and Round Bald to Carver’s Gap. Climbing back up Roan High Knob was a little strenuous, but with numerous switchbacks, it wasn’t too bad. We stopped at one point to see a rather large rabbit just off the trail. Once past the shelter, it was all downhill back to the car. Near the site of the old Cloudland Hotel, there were lots of beautiful wildflowers blooming, including a sea of lovely little bluets. Back at the car, we headed down the mountain and followed US-19 E to Elizabethton. Sandy wanted to do a little antique shopping after our hike. After browsing for an hour or so, we had dinner and then headed back to the B&B. Sunday morning, we slept in a little and had another great breakfast cooked by Ann. Looking outside, we could see some wild turkeys in the backyard. We didn’t have any definitive plans, so we chatted with Ann and Steve a bit. They suggested we check out Blue Hole Falls, near Elizabethton. A quick Google search yielded GPS coordinates and we were off. In Elizabethton, we took TN-91 northeast into Cherokee National Forest and turned left on Panhandle Road. It was only about a mile to the pull-off on the left. We could hear the waterfall from here and set off on the short trails. Blue Hole Falls consists of at least four distinct sections, maybe up to seven. We started at the highpoint and worked our way downstream. The uppermost section was a small cascade, partly blocked by rhododendron. Next was a more scenic cascade that we scrambled down to get a picture of. Continuing on, the next section was a small, but scenic drop in a narrow chasm. I had to scramble down the rocks and jump over to a sandy section for a good picture of this drop. With the grotto-like section, this was my favorite individual part of the waterfall. Next, we made it to the main Blue Hole section, with a narrow horsetail splashing into an inviting swim hole. It was too cold today for swimming, but the water was beautiful and would have been inviting in warmer weather. From here, we scrambled down to the base of the lowest section, a scenic cascade. Heading back up towards the car, we followed another trail to the cliffs above the falls. A spot up here had great views of the Blue Hole section and the cascades below. It was really cool to be able to see two distinct sections and it really provided perspective on how cool this waterfall is. I was unable to find any other spot where more than one section was visible. We noticed a trail continuing downstream along the cliffs from here and followed it. Further downstream, we found another scenic sliding section. Even further down, we found another drop, what seemed to be the last major drop on this section of creek. Thus, up to seven sections of the waterfall. We then made our way back to the car and drove back towards Roan Mountain. It was still early in the day, so we headed to Hampton Creek Cove State Natural Area for another hike. After parking, we started out on the Overmountain Victory Trail/Birchfield Trail following Left Prong of Hampton Creek upstream. We passed through a couple open fields where cows and horses were grazing. Soon, we crossed the creek on a footbridge as a herd of cows were fording the creek. They watched us cautiously as they crossed and then wandered into the field to continue grazing. We followed the Overmountain Victory Trail through the fields and soon the trail entered the woods and followed the creek more closely. At this point, we had gotten off Overmountain Victory Trail and were now following Birchfield Trail. There were lots of scenic cascades along the creek. In about 2 miles, we stopped for a break and to have a snack. It was lightly drizzling, so we started heading back. About half a mile or so back, we stayed on the Birchfield Trail, which stayed closer to the creek than Overmountain Victory Trail. This trail follows the creek more closely and had more nice views. We also saw a large number of juvenile eastern newts (red efts) right along the trail. We had to be careful not to step on them as we hiked. About half-way back, we had to rock-hop across the creek. Then there was one more field to cross. Back at the footbridge, we decided to hike the Shell Hollow Trail before heading back. This trail led through a field and then headed into the woods, climbing steeply. The trail was really overgrown and poorly-blazed, making it hard to follow. We did find some lovely spiderwort growing along the trail. After making the short loop at the top, we headed back and made our way back to the car. Being a Sunday, most places were closed. Bob’s Dairyland was the only place in Roan Mountain open, so we got barbeque and milkshakes to go and headed back to the hotel for dinner. Monday morning, we woke up and had one more delicious breakfast before checking out of the B&B. Making the short drive back into North Carolina, we turned at Elk Park and headed to Elk River Falls. We wanted to arrive early as this is a popular spot, especially on a nice Memorial Day. Arriving at around 9, there were only a couple of cars here. We first made the short hike to Elk River Falls, also called Big Falls. This beautiful 60-foot waterfall on Elk River is very scenic. I first got some pictures from the big rock at the base. Then, we scrambled down and got out on the rocks in the middle of the river for some pictures from here. We could see some of the smaller cascades below the falls from this point. As more and more people started to arrive, we headed back. But we weren’t done yet. Back at the parking lot, we followed the gated road past the waterfall and down to a ford on Elk River. From here, we followed an overgrown path to a small campsite at Jones Branch. Crossing this creek, a path headed up and intersected the Appalachian Trail. We turned left and followed the trail southbound. In about a half-mile, a spur trail led to Jones Falls. This was our target for the hike, but we wanted to get some more mileage in. So we continued hiking the AT, planning to hit Jones Falls on the way back. It was a lot of uphill for about a mile and a half, then a gradual descent for another half-mile to a road crossing at Campbell Hollow Road. We turned around here and made the mostly downhill hike back to Jones Falls. We spotted some reishi mushrooms near the spur trail. The 100-foot Jones Falls is very scenic, but hard to capture a good photo. The sun was shining right on the upper drop of the waterfall while the trees provided areas of light and shadow on the lower part. We waited for a few minutes, hoping for some cloud cover, but it never came. Before leaving, we climbed up the side of the waterfall for a profile view of the main drop of the waterfall. I really liked how the water splashed off the huge boulder in front of the falls. After some pictures, we started heading back. It was all downhill and easy making the hike back. We stopped to see some pretty wildflowers blooming near Elk River. When we arrived back at the parking, there were tons of cars, parked all along the road leading to the falls. It was a good thing we arrived early. We started making our way back home, but wanted to stop for one more waterfall on the way. In Valle Crucis, we stopped the Valle Crucis Conference Center. Although private property, the landowners are nice enough to allow public access to the waterfall. The hike is only about a half-mile, but surprisingly steep. The trail follows an old road steeply up the mountain and then down into the gorge carved by Craborchard Creek. Craborchard Falls is a long series of cascades. It’s hard to get a good picture, because there are so many sections to the waterfall, but it’s very scenic and a great place to enjoy the scenery. After a couple pictures, we headed back. We stopped for dinner in Wilkesboro and then drove the rest of the way home.